I recently wrote about Blake’s “Introduction to the Songs of Innocence” (click here to read that post). The “Introduction to the Songs of Experience” serves as a contrast, where one leaves the Edenic childlike state and moves into the realm of knowledge, along with the associated pain and suffering. The opening stanza establishes the idea of the poet as a mystic, one who is visionary and understands the transcendent power of poetry. Blake points out that the Bard has heard the “Holy Word,” which means that he understands the power that words have in the act of creation. That walk’d among the ancient trees. The second stanza addresses humanity in its fallen state. Mankind was banished from Eden as a result of its desire to know and become godlike. The fall is also symbolic of what happens to people on an individual level. Once a person becomes aware of mortality, the carefree innocence of childhood is lost forever. There is an interesting shift in the third stanza. The Bard is no longer addressing humanity in its fallen state, but is addressing the Earth. The Earth here is a representation of the Divine Feminine, which appears to be in a state of hibernation. This is likely the result of patriarchal religious beliefs that state that the Earth must be subjugated. Now the Bard beckons the Earth Goddess to awaken and renew herself. There is some ambiguity in the fourth and final stanza. Blake seems to be addressing both humanity again as well as the Earth. Depending upon how you interpret the Bard’s audience affects the symbolism. If the Bard is addressing humanity, then he is calling on people to recognize their spiritual connection to the Earth and to deny it no longer; if addressing the Earth, he is summoning the Divine Feminine to restore herself beside her masculine counterpart upon the starry throne. I personally feel that both interpretations are correct. This is a very powerful and mystical poem, and the closer you read it, the more you will find there. 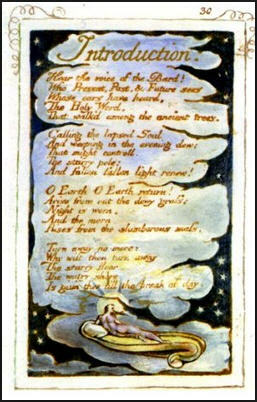 Blake’s next poem in the Songs of Experience is “EARTH’s Answer,” where the Goddess responds to the Bard. You can probably guess what my next post will be about. Click here to read “Introduction to the Songs of Experience” online.